Southeast Asia is one of the best destinations for first-time travelers. It's safe, cheap, has incredible food, glorious weather and some of the prettiest beaches you'll ever see. The beaches are one of the best parts of the region. Whether you want to recreate The Beach on Koh Phi Phi, indulge in your inner hippie on Koh Chang, escape the tourists on Koh Yao Noi, enjoy somewhere a little more laid back in Sihanoukville, learn to surf in Bali, or marvel at the cleanliness of Cua Dai beach in Hoi An, Vietnam, there's something for everyone here. Sihanoukville is a well-known party destination for twenty-something travellers on the Southeast Asia backpacker trail. While the parties located on notorious Serendipity Beach in Sihanoukville can be fun, loud and lasting all night, I prefer to head to neighbouring Otres Beach for a small slice of serenity. On Otres Beach, you won’t find any of the loud, party-seeking backpackers – it instead attracts a slightly older crowd of couples, solo travellers and expats who can never seem to leave. With the bungalows lining the beachfront costing just €10 a night, it’s the perfect place to not do much of anything for a while. Wake yourself up with a morning swim in the unbelievably warm ocean, take a day trip to some of the neighbouring islands, go for drinks at Mushroom Point and take part in the evening tradition of sitting on sun loungers to watch the always-incredible sunsets. Lonely Beach, located in the south of the Thai island of Koh Chang, is the place where Bob Marley never died. 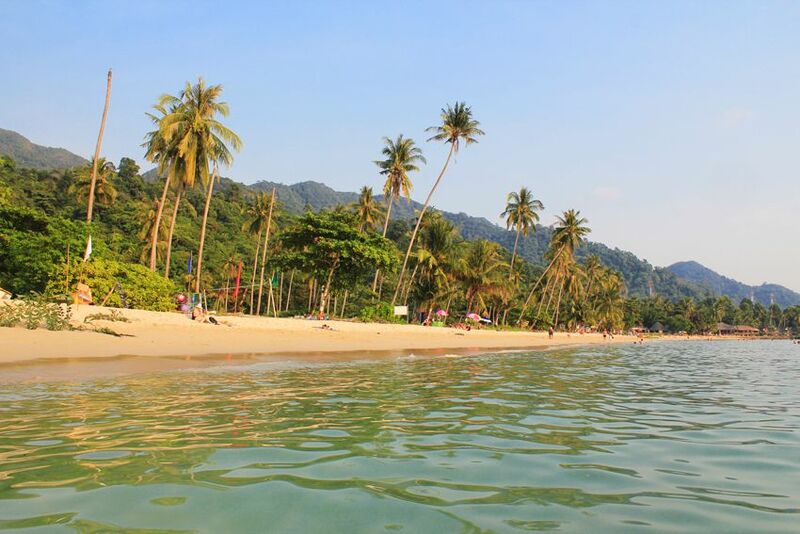 Filled with bungalows, where having a hammock hanging outside is mandatory, Koh Chang is all about relaxing during the day and partying at night. Lonely Beach is my ideal beach because it isn’t overrun with people, like many of the beaches in Southeast Asia can be. The sand was soft, and the water was practically transparent. It’s even easy to find secluded spots on the beach and trick yourself into thinking you’re sunbathing on your own private island. After spending your day sunbathing among palm trees and napping in your hammock, it’s then time to head out to some of the beach bars. The aptly named Sunset Bar is a great place to kick off the evening, with their famed seafood BBQ and €1 beers. From there, follow the sound of pumping reggae down the main strip and spend the rest of your evening drinking buckets (in Thailand, it’s common to drink from a child’s sand castle bucket!) and singing karaoke. Regularly making an appearance in lists of top ten beaches in the world, White Beach on Boracay Island is a destination everybody should visit at least once in their life. White Beach stretches four kilometres down the western side of the island, and there you can find anything you could possibly need. There’s the softest, powder-like sand you’ve ever set foot on, the clearest, warmest, turquoise water. You’ll have the opportunity to rent ATVs to explore the island, the chance to rent a boat to travel to nearby islands. You can stay in €5 a night bungalows or treat yourself with a stay in a luxury resort. You can have a massage on the beach, eat freshly caught seafood and, of course, sunbathe and relax. In the evening, the dozens of beach bars come alive with acoustic guitar performances and fire shows. With tables and chairs arranged on the beach so that the ocean can lap at your feet, there’s no reason why you can’t dance the night away on one of the best beaches in the world. Vietnam isn't know for its beaches, but there are a few jewels along its coastline that aren't well known. Take Hoi An, for example. It's known for having hundreds of tailor shops where you can get cheap clothes made over the space of a few days. The Old Town is designated a UNESCO World Heritage Site and for good reason: it's stunning and perfect for spending a few hours wandering around. Cua Dai Beach is rarely mentioned, but is one of my favourite places in Southeast Asia. Unlike many beaches in the region, it's not filled with tourists. It's easy to escape the crowds and find a spot of beach to yourself. It's surprisingly clean, too -- I didn't see a single piece of trash on the day I spent there. The sand is white, the water is warm, and there aren't too many touts ruining the peace. Highly recommended. If you're looking for a Thai island paradise without tourists, you'll find it on Koh Yao Noi, a quiet fishing island with few guesthouses to stay in. It's quiet here, Internet can be tough to find, and restaurants are sparse. If you're willing to put up with the minor difficulties, though, you'll find an amazing beach with nobody else on it. Simply head to the north east of the island on scooter and you'll find a small handwritten sign on a plank of wood, directing you into the jungle. Follow the path for half an hour and you'll be rewarded. On Had Yao Beach, I've never seen another person. It's a several kilometre long stretch of white sand looking over Phang Nga Bay and you'll have it all to yourself. Paradise. If you want to learn to surf while you're in Southeast Asia, there's one place that's famed with travelers in the region all over. Kuta Beach, in Bali, isn't the most cultured of places, but its beach has fantastic surf for beginners and a lively nightlife scene. Head here to save money, learn to surf, party with backpackers at night, and recover with some sunbathing on the beach.